Phil Babb's Hayes & Yeading side can consider themselves mightily unlucky not to be in the second round draw on Monday after United's players pushed Skrill Premier promotion chasers Barnet to the limit before going down to an 89th minute George Sykes goal. The gaffer made a single change from the side that was beaten on Tuesday with Jack Mills replacing Anthony Furlonge at right-back, the Stevenage loanee taking his place on the bench. The opening fifteen minutes passed without real incident followed quickly by a spell of three quick chances in succession. Adam Everitt launched a long throw into the Bees area that was met by skipper Dean Inman but held by Graham Stack in the Bees goal. Stack immediately launched the ball to the other end where it was collected by Keanu Marsh-Brown, Tom Bird did well to force him wide but he was still able to get a shot away that was deflected over the top. The resultant corner was flicked on by George Sykes with the ball falling nicely to former United winger Andy Yiadom on the edge of the box, his volley being well pushed away by the diving Jamie Young. Within a minute play was back in the United attacking half and Luke Williams squeezed the ball between central defenders Edgar Davids and Carl Fletcher where Jake Reid outpaced both only for Stack to be smartly off his line to block at the United strikers feet. It was noticeable that immediately following this incident the quicker Curtis Weston was switched to centre-back with Davids moving himself out to the left and Yiadom back over to his more natural right side. Sykes had a good opening around the half hour mark when put through but he fired straight into Youngs' arms and in the final minute of the half United twice went close to breaking the deadlock. Williams' free-kick was met by Inman and with his effort heading for the top corner Stack did well to tip the ball over, from the resulting corner Adam Everitt's kick was met be a flying Inman who met the ball with power but not the accuracy to trouble Stack and we went in all square at the break. 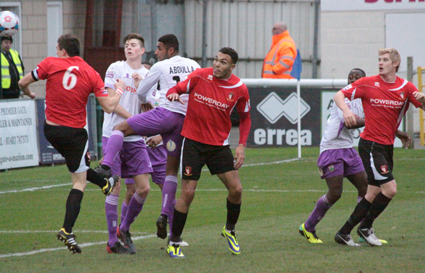 United started the second half pushing forwards and just two minutes in Frankie Merrifield burst into the box between two defenders with his cross-come shot going between United's two strikers before curling wide of the far post. Young then comfortably dealt with a Mark Byrne header from Luisma Villa's free-kick before Reid collected a loose defensive pass from the visitors in their area but not realising he had time he tried a first time effort that was wide of the target. Past the hour mark United defenders twice threw themselves in front of shots to block, the first saw Wassmer take the sting off a Marsh-Brown effort and then a similar piece of defending saw Villa denied, Young sweeping up the danger on both occasions. The Bees were starting to push on as the game entered its final phase, Merrifield made a superb defensive interception to clear away a low Marsh-Brown centre while Villa was only just wide with a 25 yard free-kick. The visitors were not having it all their own way going towards the whistle though as Geoff Mitchell did well to hold the ball on the left before sliding it to Tom Bird, his low cross towards Williams saw Stack do well to block away his close range effort. 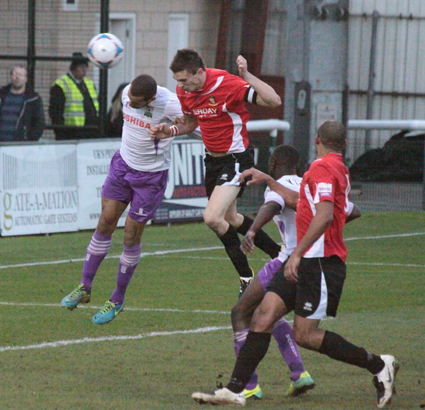 The final five minutes however saw the Skrill Premier side really give it a final push to avoid a replay. Sykes smashed the ball against the underside of the crossbar from 6 yards with Young grabbing the loose ball before the United stopper was forced into a diving save to deny Marsh-Brown who had tried to pick out the far corner of his goal. 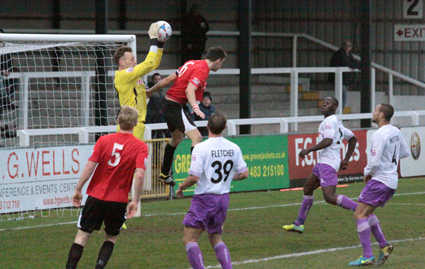 United looked to have secured a replay when Young denied Byrne with a one handed save as he burst through into the box but it was not to be as in the 89th minute Marsh-Brown's deep cross from the left was nodded down by Kieron Cadogan and with his back to goal, Sykes overhead kick crashed past Young into the United net to give the hosts a winner that on the balance was probably not quite deserved after the fight United had shown throughout the game.